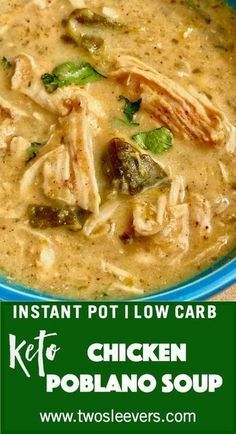 Instant Pot Low Carb chicken poblano soup makes a creamy, hearty meal that cooks in under 30 minutes. The poblano peppers really make this a standout dish! Put everything except the cream cheese into your Instant Pot, and cook at high pressure for 15 minutes. Allow it to release pressure naturally for ten minutes, and the release all remaining pressure.